From its big, long tail to its wee, little head. 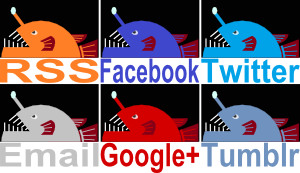 From its stumpy legs to its clunking tail. All is encompassed in an incredible suit of armour. 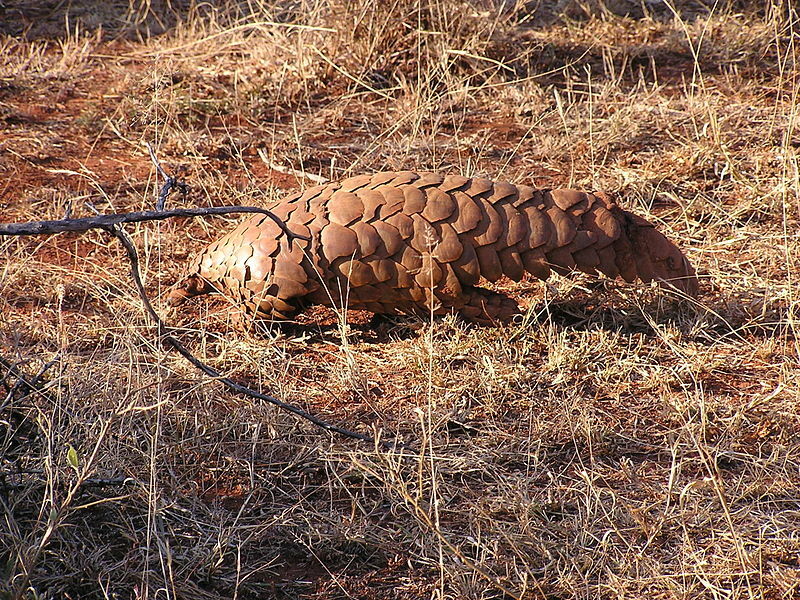 The Pangolin appears ancient and just a little bit dangerous. More dangerous than your average pinecone, anyway. There are 8 species of Pangolin. Some live in parts of sub-Saharan Africa, others in India, China and down through to Malaysia and Thailand. Some climb trees, others prefer the ground. The smallest might be just 30 cm (1 foot) long, the biggest well over a metre (3.3 feet). But they all have much in common. All Pangolins have huge claws on their front paws, used to crack open ant nests and termite mounds. They don't have teeth, but rely instead on a ridiculously long tongue and sticky saliva to slurp up the usual inhabitants of ant nests and termite mounds. Ants, termites and tax inspectors. But how long does a tongue have to be before it passes through impressive and ends up at ridiculous? Well, a really big Pangolin can have a tongue about as long as an entire small Pangolin. A 30 cm (1 foot) long tongue! When not in use, they can't even store the entire length of it in their mouth; it has to extend all the way down into their chest. I think that's ridiculous! Food is found using a great sense of smell. Their eyesight is no great shakes and they're also nocturnal. It works out fine since their munch 'ems won't be going far. 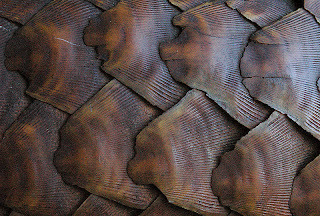 Pangolins also needn't concern themselves much with the world around them, the reason being that extraordinary scaly armour. It looks tough as nails, and it is indeed made of keratin. Those scales are also sharp so when they roll themselves into a ball, predators are faced not just with armour, but PAINFUL armour! It's like an armadillo and a hedgehog rolled into one. And then rolled into a ball. To add some more insult to insult and injury, they also release a stinky secretion from glands at the rear end. I wonder if they do that when they're rolled into a ball? In any case, you can add a bit of skunk to the mix as well. Pangolins can walk on all fours, but to do so they curl up their front paws so those all important claws don't get blunt or damaged. They can also be used to climb up trees. 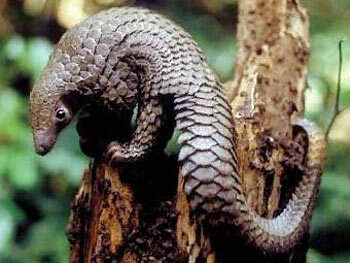 Tree-dwelling Pangolins have a strong, prehensile tail and claws on their hind paws to help out. With these grappling hooks they can climb straight up a tree trunk, no need for branches. Or ladders. Or stairs. Pangolins can also just about walk on two legs as well, using their long tail for support. It looks pretty strange, like a dangerous, spiky see-saw with tiny legs in the middle. I'm sure it would never get past the health and safety standards. You won't find this particular see-saw in your local playground. You know what else is strange? 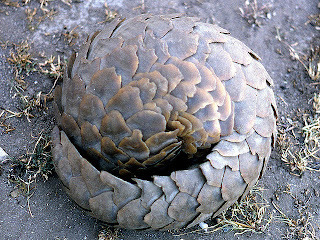 Big, ground living Pangolins have columnar hind legs, like a miniature elephant. That's just so weird! Pangolins give birth to 1 to 3 young at a time. Babies cling onto Mother's tail if she's in the trees or remain in a burrow for the ground-dwellers. If danger lurks, she will have to protect her defenceless sprogs by rolling around them. The youngsters have their scales, but they are soft at birth and take time to harden. I think on balance the mother is extremely grateful for that. fascinating critter! i really like it! Wow, these are incredible little (and not-so-little) beasts! I wanted to get my hands on one until I read about their fragrance capabilities. :D It looks like they have some magical armour equipped, I envy them! Yeh, they're quite remarkable! It can difficult to believe you could see them in a zoo without using a spaceship or some kind of portal! Sadly, these cuties are not available in the Zoo here... I was there a couple of weeks ago and I also checked their internet site to be sure I did not overlook them. It appears that they always had problems with them. They had pangolins in the Zoo several times in the 70s and 80s but they never survived long. I think they should try it again, the Zoo underwent a major reconstruction a few years ago and lot of upgrades are being made there - it looks really great now! Even the Pangolin would have no reason to be unsatisfied there! Wow! I'm impressed that you picked up so much information. Perhaps you'll have to start a petitioon! 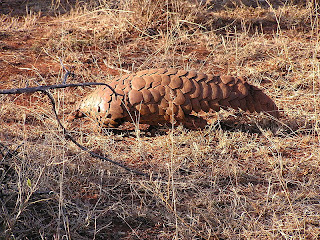 The Pangolin is one of those animals that makes me go, "pics or it didn't happen." Even then I can hardly believe they're real. It's a shame they're so endangered because once they're gone, there's no way anyone's going to believe in these guys. Also because it's always a shame when an animal goes extinct. They're incredible creatures. Even when you see 'em, they still look like an old drawing from a description of a story someone heard from a guy retelling fables that have been handed down the generations from time immemorial. Which is cool!